Anonymous proxy servers hide your IP address and thereby prevent unauthorized access to your computer through the Internet. They do not provide anyone with your IP address and effectively hide any information about you and your reading interests. Often times, they also don't even let anyone know that you are surfing through a proxy server. Anonymous proxy servers can be invaluable to people living in countries with governments that block or filter certain sites they consider wrong for their own citizens. 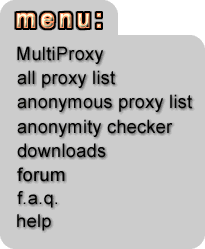 Anonymous proxy servers can be used for all kinds of Web-services, such as Web-Mail (MSN, Hotmail, Yahoo mail), web-chat rooms, FTP archives, etc. etc.